It’s not often that a restaurant dishes on where where it buys its bread, but with Bub and Grandma’s, things are different. The upstart bakery has become associated with some of the trendiest restaurants in the city—Gwen, 71 Above, Sqirl, Otoño, Here’s Looking at You—with many of those establishments touting the name proudly on their menus like a badge of honor. How did Bub and Grandma’s take the city’s artisanal bread scene by storm? It can all be traced back to Andy Kadin, a former copywriter who started baking loaves in his apartment in 2014. Kadin, who focused on using high percentages of whole grain and long fermentation times, spent a year baking bread every day. Some of his excess ciabatta made it into the hands of Scott Zwiezen, owner of the Middle Eastern café Dune, who promptly put the bread on his menu—a move that Kadin says jump-started the company’s growth. Now, a few years later, Bub and Grandma’s pumps out 2,000 picture-perfect whole-grain loaves and baguettes for more than 100 businesses across the city. Newly settled into a large production facility near the L.A. River, the bakery is experiencing the usual growing pains—including a new oven so heavy that the floor had to be reinforced—but there’s also growing business. Bub and Grandma’s recently took over bread production at Nancy Silverton’s Mozza restaurants and developed a cotton-soft Japanese-style milk bread for Echo Park café Konbi. Kadin plans to debut even more options soon—spelt, polenta, dark rye—and has plans for a sandwich shop on the Eastside next year. For now, aside from dozens of restaurants and shops, Bub and Grandma’s goods can also be found at the Hollywood Farmers’ Market on Sundays, where all its varieties (along with flatbread pizzas and pastries) are sold. If, however, long lines aren’t your thing, get a taste of it at a few of our favorite restaurants. Tailor-made for Kismet in Silver Lake, this flaky Persian flatbread is a tad thicker than naan and dusted with sesame seeds. Dune, which has locations in Atwater Village, downtown, and Venice, uses this pillowly bun for its pickled beet and egg sandwich. Kadin spent a lot of time perfecting his unconventional baguette, which uses 16 percent whole grain for a punch of flavor. Find it served as crostini at Osteria Mozza. 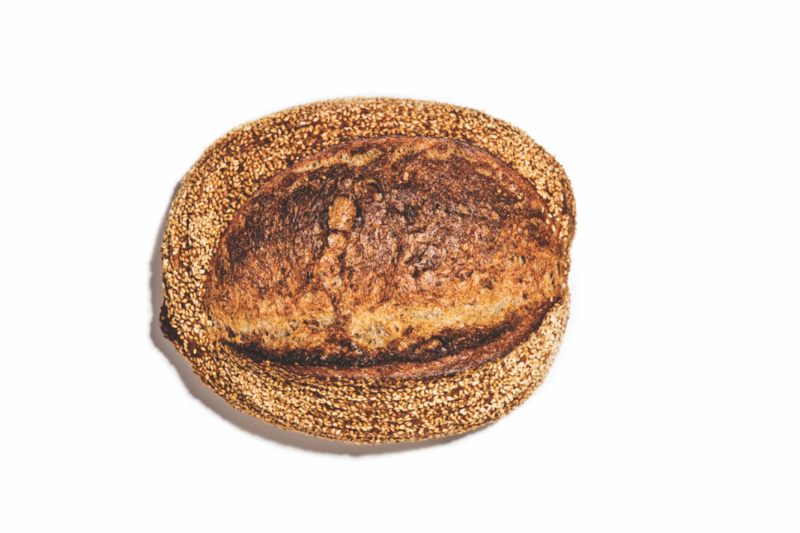 This nutty, rustic whole-wheat bread with a dark brown crust holds together the popular Ira Glass sandwich at Wax Paper in Frogtown.